The Prince of Egypt (1998) animated adaptation of the Exodus story by DreamWorks Pictures about Moses' life from a prince to his last destiny to lead the children of Israel out of Egypt. A Troll in Central Park (1994) animated analogical fantasy film (also known as Stanley's Magic Garden), about a kind and good troll which has the ability to bring flowers to life using his green thumb. FernGully The Last Rainforest (1992) an enchanting fairy animated film based on book of the same name by Diana Young, dedicated for "Our Children and Our Children's Children"
The Brave Little Toaster (1987) the story of five appliances (a toaster, a lamp, an electric blanket, a radio, and a vacuum cleaner) who go on a quest to search for their original owner. 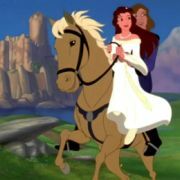 Watch Quest for Camelot (1998) about a courageous young girl who dreams to become knight of the Round Table at King Arthur's fabulous court and her journey to The Magic Sword.